Constellation Brands (STZ) is spending $4 billion to boost its stake in cannabis company Canopy Growth. Constellation also owns a big wine business, SVEDKA vodka and Casa Noble tequila. It first invested in Canopy Growth last year, when it bought a 10% stake. Wednesday's move upped its holding in Canopy to 38%, and leaves open the option to purchase a majority controlling share of more than 50%. Constellation's stock, however, fell nearly 6% after announcing the investment. Constellation CEO Rob Sands said during Canopy's earnings conference call Wednesday morning that it was an extremely exciting time to be in the cannabis business. "This could potentially be one of the most significant global growth opportunities for the next decade," Sands said. "Constellation gets it. 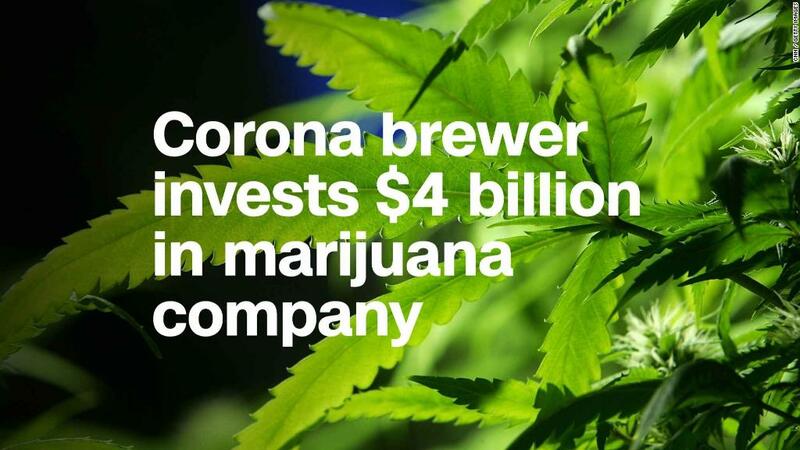 This is happening globally," Linton told Quest, adding that Constellation can benefit by being the first to market with cannabis-based drinks while other beer and alcohol companies are still trying to figure out what to do in the market. But Bonnie Herzog, an analyst with Wells Fargo, said she expects Constellation and Canopy to partner on "drinkable cannabis products given the enormous growth opportunity ahead" globally. Herzog added "there is an expectation that marijuana will eventually be legalized in the U.S."
Kevin Murphy, CEO of Acreage Holdings, a cannabis producer that has former US House Speaker John Boehner on its board, said in an email to CNNMoney that he expects more beverage companies -- and perhaps even Big Pharma firms -- to look more closely at developing cannabis products too.